Global small businesses can use local business listings on the Internet as a yellow page alternative and to be more easily located by mobile local consumers. The fact that the business can also update their offers anytime gives the local business the possibility to adapt to market changes. An affordable local business listing package, offered by SmartFinds Internet Marketing, is allowing small businesses to reduce the cost of yellow page ads. Internet based Local business listings are free through the major search engines and display in search results, as well as on mobile devices. The additional benefits include adding coupons, offers, discounts, photos, videos while changing them anytime. - something you cannot do with your yellow page ad. SmartFinds Internet Marketing launched the SmartFinds Local Listing website as an additional service offering. SmartFinds Internet Marketing CEO, Melih Oztalay, stated "this has been a long time coming to finally eliminate the yellow pages that we use as a door stop now-a-days. The benefits to small business are incredible to be available to their local customers when the customer is looking for them while being around town with their mobile device. The fact that the business can also update their offers anytime gives the local business the possibility to adapt to market changes." Oztalay, indicated that in 2010 the mobile device industry will grow exponentially. "We will have not only the iPhone, but also Blackberry and Palm are coming to market with new products and mobile applications. The wireless carriers, AT&T, Verizon and Sprint are upgrading the cell tower to allow for 4G capabilities thereby increasing the bandwidth to the mobile devices. Since all of these platforms will not all use Google Maps, it will be necessary to have your local business listing updated in all possible locations". The most critical element of SmartFinds Internet Marketing services is the creativity and imagination to apply the technological aspects of the digital marketplace to the marketing objectives of a particular business. Initial research provides SmartFinds the ability to develop a digital strategy that can be measured every step of the way to insure business growth and revenue generation. Some of SmartFinds' clients have included Compuware, Delphi, Flagstar Bank, Guardian Industries, Soave Enterprises, Detroit Convention and Visitor’s Bureau, McCann Erickson, Wendy’s and others. 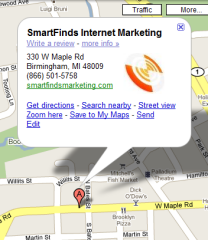 You can learn more about SmartFinds at http://www.smartfindsmarketing.com.